TIGER WOODS may have achieved the greatest sporting comeback of all time at Augusta when he won his fifth Masters title, but who won the TV battle, Sky or the BBC? There was a big change in Sky’s coverage, with frontman David Livingstone having stood down to be replaced by Nick Dougherty, and the verdict is that the boy done good! He is a calm and relaxed presence and has the advantage over Livingstone in that he has been there and done it. He knows most of the leading players and is a contemporary of them. He also knows what it is like to cope with the pressure of leading big golf tournaments. He has taken time to grow into his role but is a natural, a man who is entirely at home in his surroundings. He may have once believed that he was born to play golf at the highest level but, as it turns out, this may have the role that he was always destined for. Having suffered all the highs and lows the sport can offer, he knows what the world’s best golfers are going through. In Ewen Murray, Sky have a man who is probably the best golf commentator in the business - and he still gets excited about what is going on in front of his eyes, always able to find the right words at the right time. And he knows when to remain silent. And in Rich Beem he has a wonderful sidekick, a man who, like Dougherty, knows what it is like to win golf tournaments. He is, after all, a former USPGA champion. He clearly adores what he does. 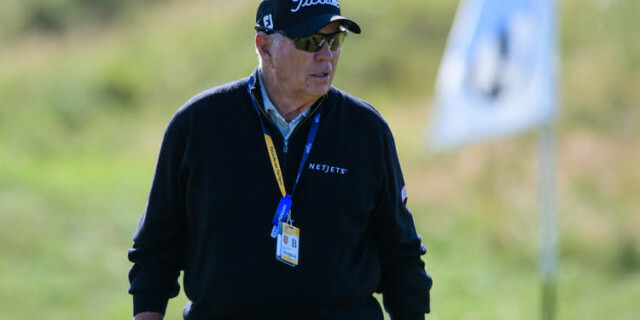 The same cannot be said for Butch Harmon. He may well be one of the most respected coaches in the game but, for me a least, his presence in the commentary box is irritating at best and just damn annoying at worst. Why does he feel the need to apply stupid nicknames to just about every player in the field? We had Jay Day (Jason Day), DJ (Dustin Johnson), Poults (Ian Poulter), Rors (Rory McIlroy), Rosey (Justin Rose) and, perhaps worst of all, Philly Mick (Phil Mickelson). As for the BBC, Ken Brown and Andrew Cotter are as good as just about anybody out there, and Aunty is to be applauded for employing Paul Azinger and Padraig Harrington (or Paddy as Harmon would call him), but Peter Alliss? Really? He was once the doyen of golf commentators, a man who made you chuckle with his little asides. Now he barely knows what is going on around him. For times he told us how pleased he was to see Tiger’s mother standing behind the 18th green. Four times! And his eyesight is clearly failing him - he had Molinari in a bunker when it was clear to everybody watching that the Italian’s ball was nowhere near the sand. He had another ball plugged on a bank when it had clearly run back into the water. At least he managed to realise that Woods had won the thing! Azinger and Harrington won four majors between them. Azinger is a former US Ryder Cup captain while Harrington is the current European skipper. So they know a thing or to about golf. And the thing with Harrington is that he loves to talk. Several times during that final round he criticised Woods and others for both their shot selection and strategy but, Harrington being Harrington, was happy to change his mind. He does that rather a lot, and is all the more endearing because of it - this is a man who could have a big future with the microphone if he ever decides to hang up his golf bag. Azinger is already a star of the commentary box back home in America and it is easy to understand why. He is a highly intelligent man with a dry sense of humour and an intimate knowledge of both the game and the men and women who play it at the highest level. As an analyst and commentator, he takes some beating. Brown remains a quirky presence whose best role is probably as an on-course analyst. There are those who don’t like his approach - but for many others he is a star. Another big plus for the BBC is that their coverage was uninterrupted, with no infuriating ad breaks at precisely the wrong moment. So what is the verdict? Sadly, the BBC only had two days of live coverage, as well as Peter Alliss, so, for me a least, Sky win this one by a nose. Finally, a word of praise for BBC 5 Live. We will surely all agree that golf is not a natural sport when it comes to radio coverage but Iain Carter is in a class of his own when it comes to painting pictures with words and it is about time that somebody snapped him to do the job on TV.